On Tuesday, aerospace company Boeing completed the first ever test flight of its autonomous passenger air vehicle (PAV) — a flying car, basically — at a facility in Virginia. The prototype, which sports wings and a rear propeller, completed a takeoff and hovered to test its “autonomous functions and ground control systems,” according to an official press release. In other words, the world is one step closer to a practical flying car. The PAV was designed by Boeing research subsidiary Aurora Flight Sciences, and is part of Boeing NeXt, the company’s urban air travel division.Other Boeing NeXt projects include an electric unmanned cargo air vehicle that can carry up to 500 pounds (227 kilos). Boeing’s flying car is 30 feet (9 meters) long and has a range of up to 50 miles (80.5 kilometers). Notably, it will mostly fly itself. Boeing says it will eventually be capable of fully autonomous flight from takeoff to landing. 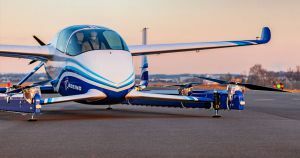 “Certifiable autonomy is going to make quiet, clean and safe urban air mobility possible,” CEO of Boeing subsidiary Aurora Flight Science John Langford said in the press release. The race to bring the flying car to the mainstream is only starting to heat up. Vahana, a subsidiary of aerospace giant Airbus, completed its first test flight of its flying car last year. A number of smaller aerospace companies are also working on competing models. We’re inching ever closer to a future in which individuals will be able to take to the skies on board flying cars. Once the tech is thoroughly tested, its future will be in the hands of federal regulators — and marketers tasked with selling the futuristic rides to consumers.